I'm going to walk you through one method of bearproofing your garbage. I should say first that the best method of bearproofing is to avoid the situation entirely - store your garbage indoors or in a locked garage - and I should say as well that if you have automated garbage pickup like I do that you don't own your garbage cans and thus you might get fined from the city you live in for modifying cans. The eyebolt, nut and fender washer make up an "eyebolt assembly" and I used four of them total. 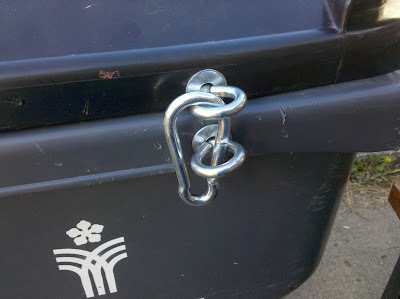 On each side of the garbage can I installed one eyebolt assembly to the garbage can and one to the lid. 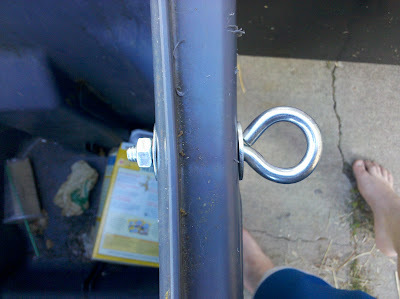 The carabiner then attaches the eyebolts together. 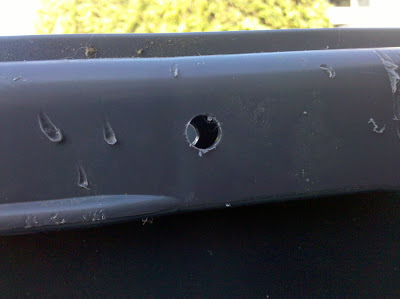 When I drilled my holes I used a 1/4" lip drill bit which is just slightly undersized (deliberately) for the size of the bolt. 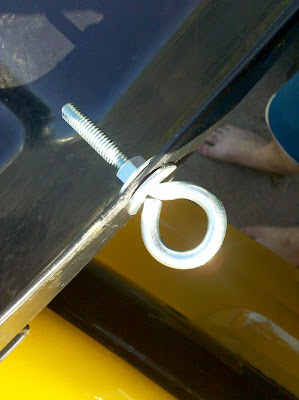 I then attached one fender washer to the eyebolt and advanced it through the hole. The hole was sized such that I had to turn the eyebolt to advance it forward - it was too snug to advance with force alone. 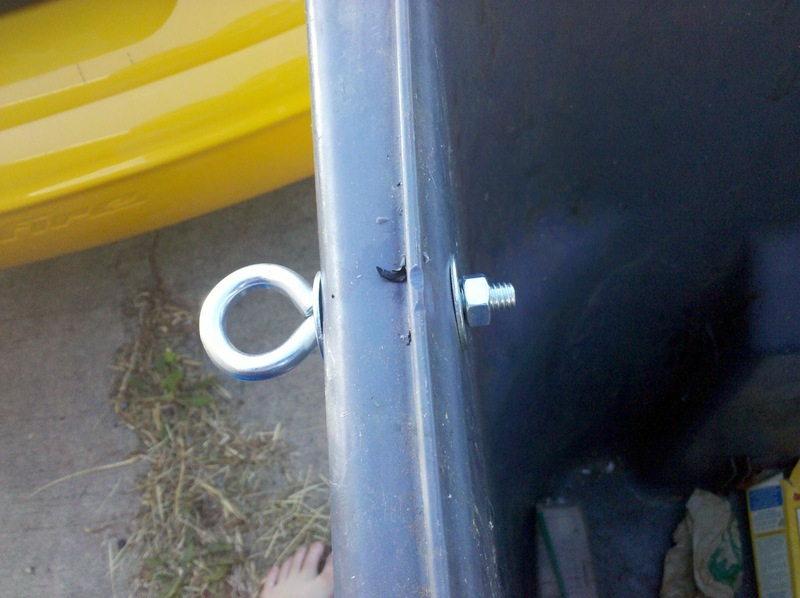 Once the eyebolt was through I then installed the second fender washer and the nut behind it. I used a crescent wrench and turned the eyebolt until the assembly fit together snugly. Looking at the eyebolt assembly through the lid. Looking at the eyebolt assembly on the other side of the can. 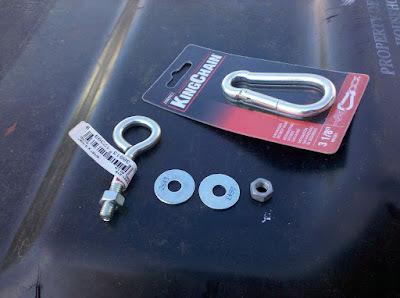 Locking the eyebolts together with the carabiner. It cost about $12 from Home Depot - all standard parts. I took me about 5-10 minutes to assemble everything. 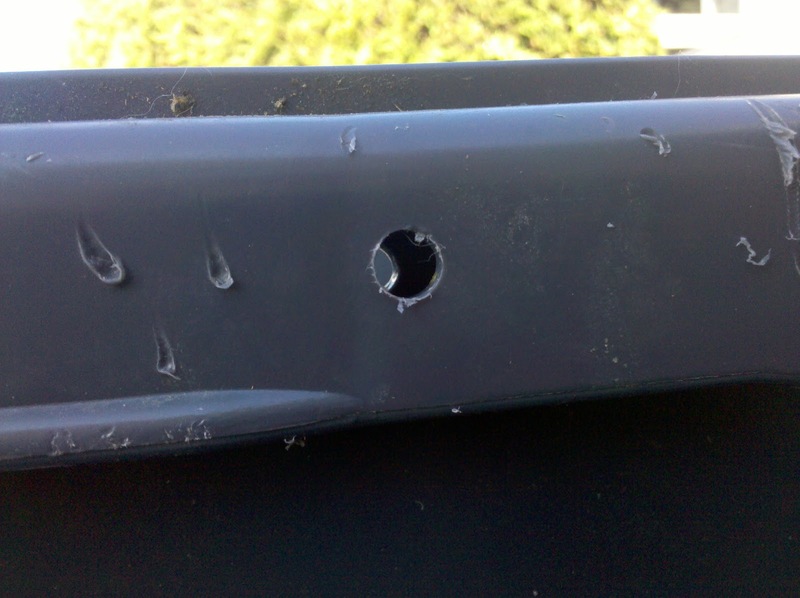 I might have considered using a locking nut instead of a standard nut. The eyebolts were snug for length - I had originally planned on using a pair of nuts of each side of the fender washers to sinch it tight which I couldn't do with the 3-1/4" eyebolt but it wasn't necessary in the end. I think in the end it worked out exactly as I had hoped/planned. Looking back I'd say I felt this was a 9/10.